Hibiclens Antiseptic Antimicrobial Skin Cleansers is ideal for cleaning both superficial wounds as well as skin. It is designed to be gentle to the skin and wound area, and for up to 24 hours it provides protection from infection. 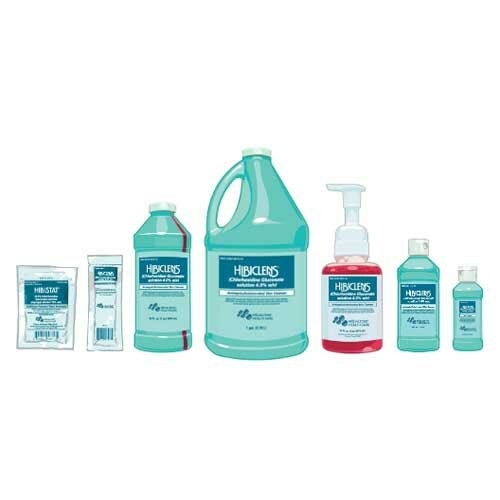 Hibiclens soap can meet many of your antiseptic needs such as surgical hand scrub, personnel hand wash, preoperative skin preparation, and more. Also, this antiseptic is available in a variety of sizes and options. The most common form is large bottles ranging from four ounces to one gallon. It is also available in small packets of towelettes. In addition, for easier dispensing you can purchase hand pumps for the sixteen ounce or larger bottles. What is the Soap Used For? My husband uses this for hand washing before and after using his catheter. It keeps his chances of infection down. Great stuff. Using Vitality Medical is really great prices and shipping. I ordered case of Hibiclens antiseptic cleanser (four one-gallon bottles) online. I chose the cheapest mode of transportation (allow 7 to 10 days) but was pleased to find that it arrived on my doorstep only 26 hours after I placed my order. If I need more in the future I would not hesitate to order it from the same source. Had an external fixator placed on my lower leg and the Doc recommended using Hibiclens and Alcohol for pin site care. Works well and prevents infections.